Once again, the sundial shows us another day is nearly over and we are just four days from the next Garden Bloggers' Bloom Day on June 15th. As a reminder for those who haven't participated before or have forgotten, on Garden Bloggers' Bloom Day on the 15th of every month, post on your blog what is blooming in your garden, then come over here to my blog and leave a comment on my GBBD post so we can find you and your post. I keep the rules of Garden Bloggers' Bloom Day to a minimum. Post whatever you feel like posting about what's blooming on the 15th and leave a comment here to let us know you've posted. That's pretty much it as far as rules go. You can even post late, if you happen to be busy on the 15th. Already I am looking around the garden to see what will be blooming on Friday and it makes me see the entire garden in a different way, the way a vistor might see it. I want lots to be blooming and be at the peak of perfection. This hosta, unfortunately, isn't nearly the perfection it should be right now. This is the passalong hosta from my youngest sister. It is supposed to have great big leaves, and last year it did. I wonder if something I did stunted its growth? Let's see... last spring I dug it up and divided it at her house and brought a division to my house where I promptly planted it. Then I decided it was planted where the miniature garden needed to be, so I dug it up and put it in a large container for the rest of the summer, and there it overwintered. 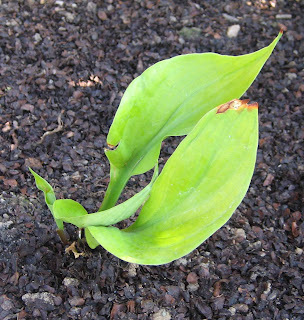 Then it sprouted and grew some leaves and I transplanted it to the center of the hosta bed to be THE hosta, the one that everyone would exclaim over. "My, what large leaves", they would say! Other than accidently turning it upside and nearly crushing it with the root ball, I'd say it was an ordinary transplanting process. So it's a mystery why it is just sitting there not growing. I'll have to go to the big hosta show coming to Indianapolis and ask one of the experts. Yes, "the greatest spectacle in hosta", the American Hosta Society's 2007 convention, is in town next week and it looks like they have some times when they will be open to the public. I think I'll try to go and see some hostas, maybe buy a new big one or a new miniature one, and ask about my hosta. Another mystery is what happened to the baby wrens. Yes, the nest is empty. I went to check on the baby wren, "Lily" and the first thing I noticed was the nest was lower in the lilac shrub than before, and it was empty. There is no sign of the unhatched egg or the baby bird. There is no baby bird on the ground anywhere around the nest, either. No signs of struggle, or anything like that. It's a mystery what happened, but it sounds like this may not have been a happy ending. How long does it take a baby wren to leave the nest. Yesterday the baby bird was sporting some feathers , so maybe today it flew off and is on its own now. Right? Its incredible how this Garden Blogger's Day has now influenced my behavior-I made sure to apply bloom booster a few days ago LOL. Actually its a bit late, many plants should have had them a week earlier,to ensure blooms for the 15th, but I didn't get time outside ( rather, it was just too hot most of the day to go do that). Sorry to see the wren nest empty. I have started working on my Garden Bloggers Bloom Day post already so maybe I can actually get it posted on time. It takes wrens about a minute and a half to fledge. Once they are ready, they fly and leave. Once the babies have fledged, the parents don't bring them back to the nest, but begin teaching them to hunt. 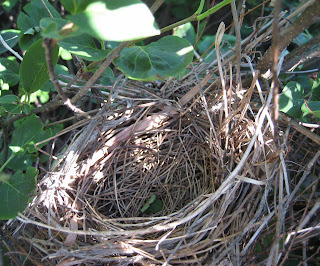 After the kids are on their own, they come back and refurbish the nest and start over. But, raccoons, and possums and snakes and cats like little birds and little eggs. However, I'm with you, I'd assume a happy ending. About your hosta. HOW many times did you transplant it in one year? Was that three? What it is probably doing this year is making roots, and storing up energy so that it can make lots of really big leaves next year. I have a tendency to be a penny pincher. I love to buy hostas that have a whole bunch of eyes when they are in the pot. Then I come home and tear them apart and get 6 hostas for one money. Usually I have to wait a couple of growing seasons for them to recover from this treatment. They don't die, but they also don't put out a bunch of leaves or bloom either. The good news is, if you will just be patient, this hosta will turn into that incredible specimin with the big leaves. Maybe even next year. Give it a good mulching and water it regularly. I also have such mysteries around the nest in my garden and have to trust that mother nature handled the matter in her own way what ever the outcome. Oh, I do hope the little bird wasn't harmed. 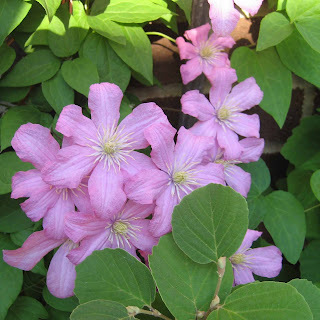 Your clematis (I'm assuming that is what it is) is gorgeous. June 15th is my son's 15th birthday, I can't believe it is here already. We had an amazing wren experience - some Carolina wrens nested in a plant on a little table on our back patio. to protect the birds from our dogs - we moved the table in front of the window and put other furniture around it - thus enabling us to actually look INTO the nest and watch the fledglings hatch and grow and get fed. They stayed in the nest about 12 days - fed by loving Mom and Dad - and I was so lucky to actually watch them climb out onto the sheets I put around the pot and hop down to the ground and away. They never came back, it went so fast, so maybe yours just flew away. I know some birds stay longer, or leave and come back, but not wrens. Hope that's of some comfort. We are watching 4 baby cliff swallows under our front porch now, almost ready to leave and pooping everywhere, but so cute! Hostas are my nemesis, Carol. I can put them in the ground but I can't grow them. Out of all the ones I've planted, I have one left which looks only marginally better than the one you pictured. And when I went back to Michigan and saw how they COULD look, I knew I could never achieve that so I gave up. Poor little wren. Well, they'll nest again, hopefully with better luck. P.S. So far I've been too lazy to do Garden Bloom Day. I think healingmagichands is right on the money. Even a hosta that has only been transplanted once in a season takes about three years to get up to full size. I'm sure the hosta society has a website where they address this very question. I can't imagine why your hosta isn't thriving, though I had a few with considerable freeze damage this spring. I have left hosta out of the ground, just laying on top of the soil for weeks, and they are fine. I cleaned out my wren house the other day and found two skeleton's. Something must have happened to the mother, and so the babies died. That's why they didn't come back this year. Bummer. Can't imagine why your hosta is doing so poorly. grin! Oh dear, the list of plants in bloom for GBBD is getting longer and longer. I hope little Lily is ok, you never know. Nicole... I would guess where you are there are always lots of blooms! Healingmagichands... Happy to hear you are working on your bloom day post. On the hosta, I've never had one I transplanted 'stall' like this on me. I'll be patient! Diane Kirby... what an interesting wren story and how fun to watch them all grow up and fly away. LostRoses... you need to get over that laziness and post something about your blooms on the 15th. We want to see what's blooming in Colorado! Kathy... I should do some searching online for answers, but that's where I'm lazy! Vonlafin... I agree, hostas are pretty tough plants, hard not to have them grow... too bad about your baby wrens. Yolanda Elizabet... 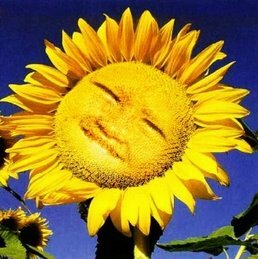 I'm looking forward to your bloom day post. I did figure out what happened to the little wren this evening, but won't post about it. Eleanor... Jake was around here yesterday evening, maybe he does know! Conventional wisdom is actually that it takes 6 years undisturbed for a hosta to achieve its full mature size. Whenever I see statements like that, I figure that I would have a lush, jungle-y yard already if I would only leave the plants be and quit moving them around. lol. Blackswamp_Girl... I've never had to wait 6 years for a hosta to recover from tranplanting or divisions! I think it is the dry weather.